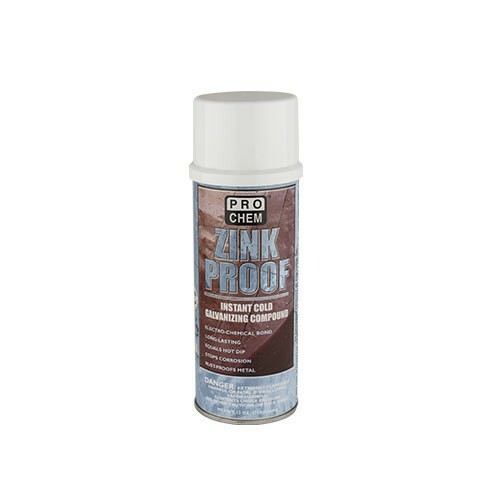 Zink Proof | Pro Chem, Inc.
ZINK PROOF is a high solids zinc coating that electrically bonds itself to metal surfaces. It equals protection provided by hot dip galvanizing methods. It renews worn or damaged hot galvanized surfaces. It also resists corrosion and rust migration. It provides a tough, durable gray surface. This product can also be used as a primer prior to painting. It protects metal surfaces from salt water and chemical fume corrosion. Available as an aerosol or as a bulk liquid. Shake can vigorously before and during use. Shake can until agitator ball begins to rattle. Continue shaking for at least one minute after to ensure that all the zinc is in suspension. Surface must be free from all loose rust, oil, grease and old paint. Spray with a sweeping motion, holding can no closer than 10 inches from surface. Coating should be dry to the touch in 15 minutes. May be painted over after allowing approximately six hours to dry. Cures in 24-48 hours. Several thin coats are better than one heavy coat.